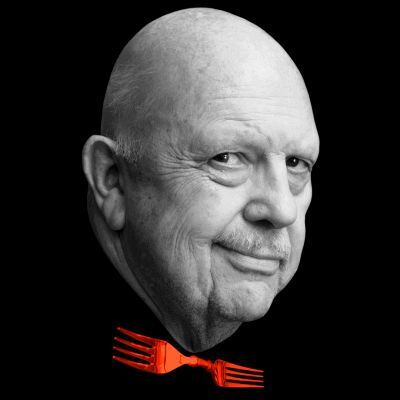 A remembrance of friendship with the late, great James Beard. By Jane and Michael Stern. Originally published on Saveur.com on January 3, 2012. An old snapshot taken from our car’s rear seat shows only the back of a head. It is James Beard’s. Like the huge stone statues of Easter Island or an image of Buddha himself, the large, bald, freckled cranium is an instantly recognizable icon. In our faded photo, he is sitting uncomfortably in the passenger seat of our well-worn VW Beetle, waiting to drive off with us on some dining adventure. 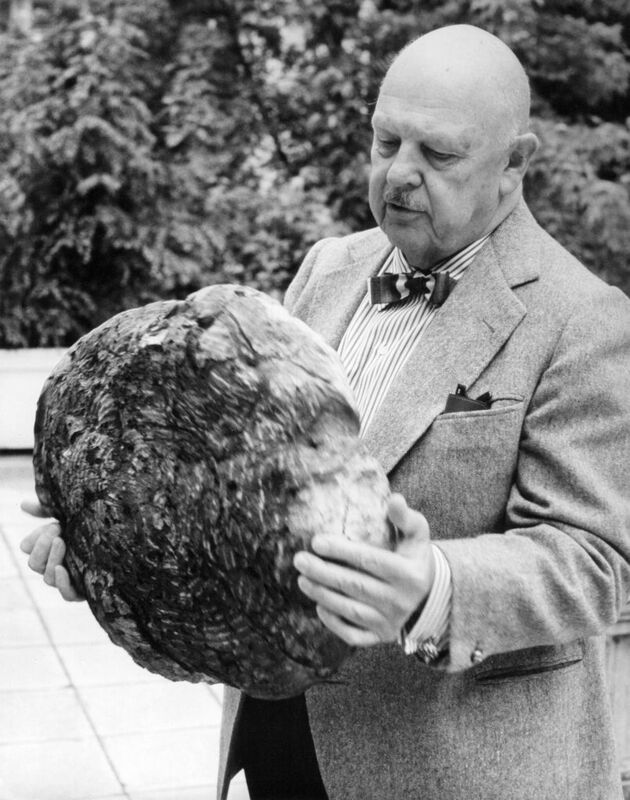 We met James Beard when he was an old man, already in his late seventies, slowed by ill health and fond of wearing corduroy bedroom slippers and voluminous smocks to accommodate his bulk. It was just after he had championed our first book, Roadfood (Random House, 1978), in his syndicated newspaper column. We were young, knew nobody in the food world, and were sassy enough to go against the prevailing winds of nouvelle cuisine by writing a book celebrating square meals in America’s diners and quick-eats cafes. Beard, having grown up in Oregon and having traveled plenty, was a huge fan of regional foods and embraced our mission. His kudos helped put us on the map as food writers, and when we called to thank him, he suggested that we meet in person. Our original visit to his brownstone in Greenwich Village was the first of what became a weekend ritual: an afternoon of chitchat that ended with a trip to a restaurant of his choice. We would squash him into our little car and drive the short distance. Why we never took a cab remains a mystery lost to time. It would be charming to imagine the great man taking two fledglings under his wing to gracefully guide us into his rarified world. In a sense he did, but there was nothing graceful about it. During our first visit to his home, he asked if we would like a glass of bubbly. Presuming he meant seltzer, we said yes, and were shocked enough at the first sip of champagne that Jane dropped the crystal flute on the kitchen floor, smashing it. To atone for her humiliation, she baked dog biscuits for Beard’s pug, Percy. Master offered his dog one of the cookies; dog took a tentative bite and spit it out in disgust. This was especially heartbreaking because dogs were a lively topic of discussion with Beard. He knew we loved our bullmastiffs, Beulah and Edwina, as much as he loved Percy; we often traded mushy eulogies to the wonders of canine companionship. We once accompanied Beard to a dinner party at the home of one of his gastronome friends. Utterly terrified by the conversation, we stayed mute unless a question was directed our way. “Where in Connecticut is your source for caul?” asked one famous cookbook writer. Having no idea what caul was (we later looked it up: It’s the fatty membrane of a pig’s intestines, often used to wrap sausage or pate), we mumbled something about how our rural town had not only an A&P but also a Stop & Shop. “I see,” the snooty broad said with an icy smirk. Most of our time with Beard was not so trying. One year, just before Christmas, we spent a delirious afternoon helping him open an endless stream of gifts from seemingly every restaurant, acolyte, publisher, and fan. We would read him the cards, hold up the jams, cookies, wines, and so on, and wait for his thumbs-up or down: “That’s nice, put it aside,” or “What a piece of crap, throw it away.” We took home the rejects, which we happily feasted on long past New Year’s. The meal that crystallized our unusual friendship took place at Lutece, generally acknowledged at the time to be the best restaurant in America. Knowing that we had never set foot in Lutece amused Beard, so he called his old friend Andre Soltner, the chef and proprietor, and told him we were coming to lunch. When we arrived, Soltner rushed over, hugged Beard, and seated us at a large table in the center of Lutece’s famous garden room. Every customer recognized Beard, and as we began to talk, it was clear the entire restaurant was eavesdropping. We don’t remember what Soltner cooked for us or much else about that afternoon other than the horrified looks on the faces of our fellow diners as that conversation ensued. But we hold the memory dear. It reminds us that having known this singular, generous, and quirky man, long before his name was attached to the prestigious food industry awards, is one of the joys of our lives.